far-red light rays which stimulates more rapid growth and development. Even without all the fancy cages and fabric, tomato plants generally produce a lot of fruit and are fairly easy to take care of. Tomatoes can be eaten raw or cooked; they can flavor a salad or sandwich, accompany an egg or buttered toast and can be cooked down to make a sauce or soup. With all these uses, the idea that tomatoes were once thought to be poinsonous seems almost laughable. We are very lucky to have them year round, but we all wait for the best tasting ones which are from summertime, backyard gardens or farmers' markets. 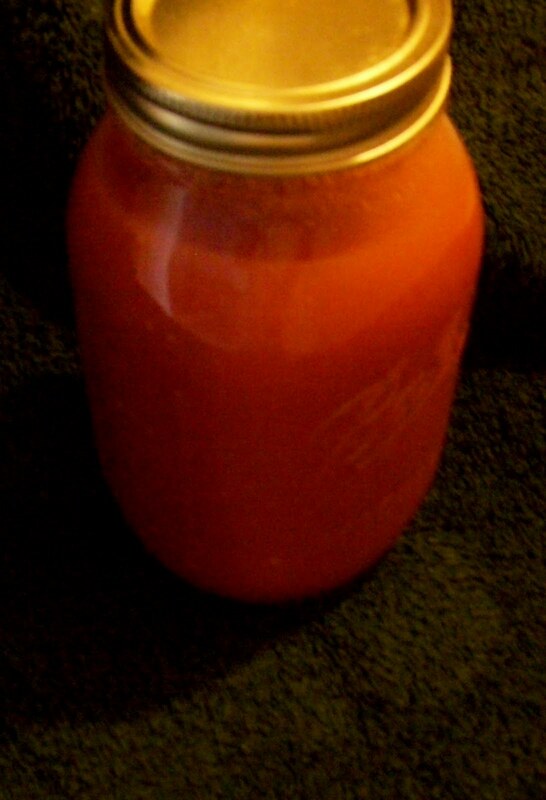 One way to keep tomatoes tasting great is to never put them in the refrigerator. Temperatures below 55 degrees will destroy the balance of sugars and acids. Leave your tomatoes at room temperature and away from direct sunlight. Putting them in a brown paper bag may help ripen tomatoes, if necessary. No matter how careful a gardener is, there will usually be some tomatoes in the garden that are bruised, split, or chewed on by an insect or worm. If harvested soon enough, these are usually the ones used for canning or salvaged to be made into wonderful sauces. Of course, perfect tomatoes may also be used for this recipe. Cut stem from tomatoes and remove any bruises or split surfaces. *Give the cut tomato the 'smell' test before continuing...only process if the fragrance of the flesh smells like a clean, freshly cut tomato. With your fingers, push away as many seeds as possible away from the body of the fruit and discard. Place, unpeeled tomato into a food processor or Vita Mix machine. Continue with remaining tomatoes. Add balance of ingredients and process until smooth. Pour mixture into a large pot and simmer. Do not scorch. At first the blend will be pinkish and frothy. Stir occasionally. As it cooks, the froth will disappear and the color of the liquid will become bright red. Continue cooking until mixture reaches the desired thickness. Cool slightly and pour through a sieve. 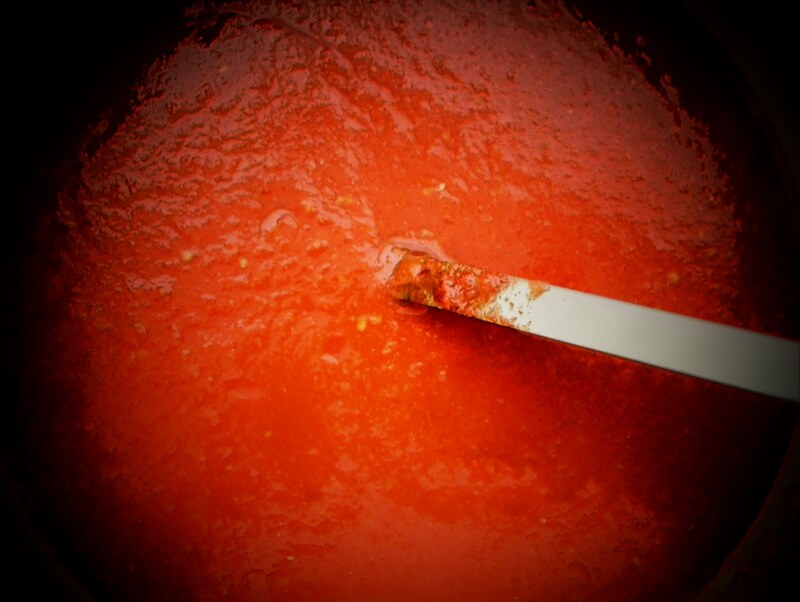 Process the remaining pulp with a ricer which will extract the rest of the tomato sauce from any seeds that remain. The quart of sauce pictured was made with a triple batch of sauce recipe.